Birthday Card Maker Software is used to design and create own style birthday card with added feature including text messages, photo and messages addition facility. Software helps users to create customized and colorful birthday cards with support to major card designing objects including Text, Picture, Line, Arc, Pencil, Ellipse, Triangle and other image designing objects. 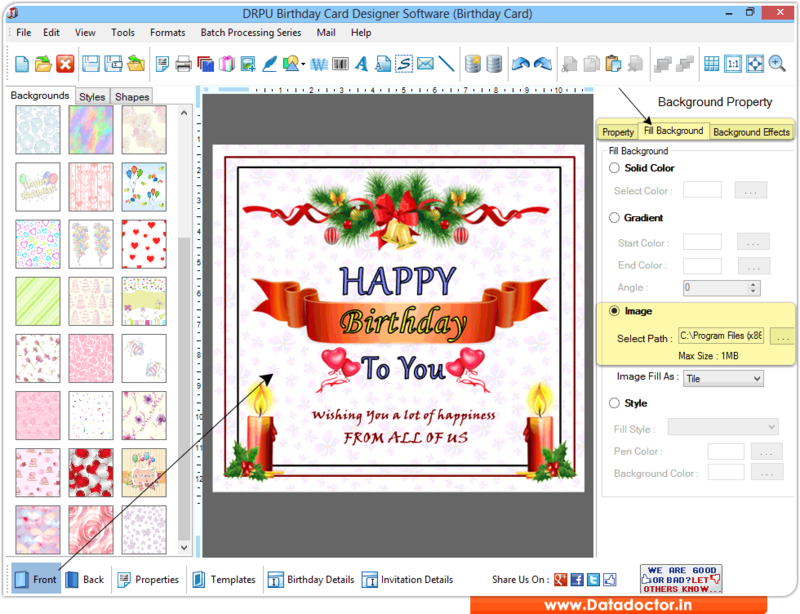 Software easily generates Birthday Cards with advance print option in easy to use graphical user interface. Birthday card maker program is designed with Batch Processing Series Feature to design multiple birthday cards with different barcode and text value. • E-mail Setting: Software provides E-mail setting feature to send generated birthday cards at specified email address. • Batch Processing Series: Using this feature, you can design multiple birthday cards along with different barcode and text value. • Print Setting: Option to print created birthday cards using advance print settings. • Advanced Image Designing Objects: Design birthday cards using Text, Line, Rectangle, Ellipse, Triangle, Star, Symbols, Signature, Barcode, Watermark and Images. • Option to save designed Birthday Card at user specified location. • You can design new cards and modify existing cards with Font, Color and image settings of birthday card software.